IONIQ car sharing has ended per 30 December 2018. App users who try to use the app will get the message: no internet connection. Where can I find the IONIQ Start & Drive user manual? All IONIQ car sharing cars are spacious 5 person 100% electric Hyundai IONIQ's. With an average radius of 200-220 km, a CO2 emission of 0% and a wealth of equipment, the ideal car to make private and business trips extremely comfortable. All cars are equipped with navigation system, rear-view camera, audio system, bluetooth car kit, Apple Carplay, and fully automatic air conditioning. Where can I rent the IONIQ car sharing cars? IONIQ cars are only for rent in Amsterdam. You can book and use an IONIQ car sharing car 24/7. Even in the evening and at weekends. You control everything with your smartphone. You only pay for the time you use the car. For 10 minutes, one hour, one afternoon or a day. You can pick up and leave the cars everywhere in the Amsterdam area we operate in. All costs and kilometers are included and there is a charging keychain/card in the car to charge the car when needed. The cars have a parking permit that allows you to park free of charge on all public paid street parking spaces within the city limits of Amsterdam. Where can I change my settings and data? In the app, you can change your preferences via the settings menu. Changes to your personal details (address, mobile phone number, email address or driving license) can be communicated to our customer service. How is the insurance arranged? The car is fully insured and includes an Personal Accident Insurance. How do I report a complaint, question or suggestion? We continuously work on the quality of our services. If you have a complaint, a question or would you like to share a suggestion with us? • Send an e-mail to support@ioniqcarsharing.nl with as subject description complaint, question or suggestion. • Give a clear description • Your e-mail will be processed by our customer service • We will respond to your message by email within 3 working days. You can also pass your complaint, question or suggestion to us in writing. Send your letter to: IONIQ car sharing, PO Box 122, 7468 ZJ Enter, The Netherlands. Which smartphones is the App available for? The IONIQ car sharing app is available for iOS and Android smartphones that: Support Bluetooth Low Energy (BLE / 4.0) and run on the operating system iOS version 7 or higher or Android version 4.3 (Jellybean) or higher. You can enroll yourself via the IONIQ car sharing app. The app creates a user account. Follow the instructions in the app to make photos of your driver's license, selfie and for non-NL residents photos of driving license, selfie and passport or ID. Finally, select your payment method (credit card or direct debit) and autohorize us to collect the car usage costs by clicking on the link you will receive in your email. Click here to download the app. Click here for the iOS app and click here for the Android app. What conditions should I meet in order to sign up? You are 18 years or older and have a valid driving license for at least 1 year. Non NL residents should also be in possession of a valid passport or ID. Which driving licenses are accepted? Can I rent as a company? We do not have corporate accounts (facilities) but naturally you can pay with your business payment method. Basically there is no need to cancel your account if you do use our services for a while. You only pay for the actual use of the car. Still want to end / stop? Send an e-mail to support@ioniqcarsharing.nl. Where can I find an overview of all rates? The current rental rates and additional costs can be found on our website. Click here to go to the rates overview. The rental rates are all-in, this means: - Use of the car - Insurance - Unlimited mileage - EV charging In case of damage, there is a non waivable excess / own risk of € 250.00 per damage event. You can book the car via the IONIQ car sharing app on your smartphone by selecting an available car on the map. This will be held for you for a maximum of 30 minutes to reach the car. You pay from the moment you press the button 'start use'. When can I book a car? You can book 7 days a week 24 hours a day. Even a few minutes before you need the car, you can make a reservation. 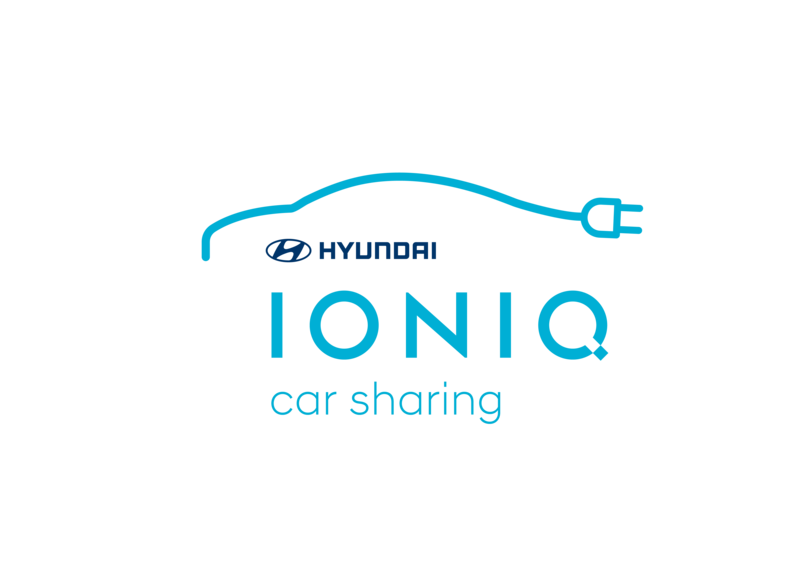 Use the IONIQ car sharing app to make a reservation. The minimum rental period is 1 minute. The maximum rental period is 7 days. Yes, without reservation, you can not open the car. Can I reserve an IONIQ car in another city? No, currently the IONIQ electric cars can only be reserved in Amsterdam. Can I travel abroad with an IONIQ? Driving abroad is only permitted in the surrounding countries Belgium, Luxembourg and Germany only when you request for permission in advance. Please contact customer service via support@ioniqcarsharing.nl) or by telephone. Driving in Germany is not allowed in the winter period / with frost because the IONIQs do not have winter tires. A reservation can only be canceled if the rental period has not yet been started. Once you start using, the rental period will be started and the rental / usuage costs will be shown in the app. In the sign-up process, you can specify which payment method you wish. You can choose from: 1. Automatic payment with your credit card 2. Direct debit to your bank account To do this, you must authorize us by means of a so-called e-Mandate. During the sign up process, you will receive a confirmation link by email. An e-Mandate is another word for Digital Debit Authorization. This is the new way to issue a continuous debit authorization online through your bank. This so-called digital signature replaces the required signature on paper. In the sign-up process you will receive an e-mail with link to confirm your authorization handled by our service partners PayByLink and Twikey. Will IONIQ car sharing save my payment information? No, your payment details (credit card or bank account data) are not stored in our system. Are payment details and payments processed securely? All payment information and payments are processed securely through our payment-specialized service partners which comply with the so-called PCI DSS security standard. PCI DSS stands for Payment Card Industry Data Security Standard. This is an international security standard, determined by the various payment card companies. This standard tries to protect payment card data and to prevent abuse of card data, and consequently damage. PCI DSS sets requirements for processing, forwarding and storing card data. All companies that accept credit cards must comply with the PCI DSS safety statement. This is tested annually and helps prevent fraud. When will payment be settled? Settlement takes place automatically by direct debit after ending of the rental period. After using the car, you will receive the invoice by e-mail. What is specified on the invoice? On the invoice you will find the information regarding your trip / rental period, such as date, costs and VAT. Can I also view my invoices online? Yes, you can always view your invoices online in your app. Yes that is possible. Please contact our customer service. Can I reduce the own risk (non waivable excess)? By default, we offer a reduced non waivable excess (own risk) of € 250,00 per damage event It will soon be possible to reduce the excess amount to € 0.00. At the time of booking only current rates apply. Only registered persons in possession of a valid driver's license may drive the cars. You always need a suitable smartphone to use the IONIQ car sharing app to book a car, open the doors and close the car and use the car. You check before you start the car on new (not yet registered) defects and damage and report it in the app before using the car. During the ride you are responsible for the car, even when you're on the go. You do not smoke in the car and always keep it clean. In case of problems, always contact us, for example, if there is any damage to the car. Traffic violations and related measures, penalties or charges on parking, during or due to the ride and in connection with fault parking at the end of the rental period are for your risk and account. The ride has ended when you parked the car at an authorized parking area within our area of ​​operation within the city limits of Amsterdam, closed the car and connected the charging cable properly if the electric car battery is to be charged or if you parked the car in front of a public charging station. After the end of the period of use, the rental cost will be settled via direct debet and you will receive the invoice via email. Are the cars cleaned regularly? The cars are cleaned and checked at least once every 14 days. If you get into a dirty car, please let us know. We will ensure that the car is cleaned as soon as possible. Can I transport pets in the car? No, it is not allowed to transport pets. Other users may suffer from allergies. If it is found that you have done so, the cost of professional cleaning will be charged. How does the virtual key work? The iONIQ car sharing system works without normal car keys. Once you make a reservation, a so-called virtual-digital key is sent to your smartphone. If you stand next to the car and press 'Start use' in the App, two buttons appear, one to open doors and one for closing doors. Your smartphone will replace the normal car key. No, that's the nice thing about IONIQ car sharing. You can leave the car everywhere in our working area in Amsterdam as long as you park the car in an allowed parking area. Only a limited number of industrial sites and neighborhoods fall outside our operative range. Click here for a map of our work area. After pressing open doors, enter the car and start the engine by pressing the start button. It is located to the right of the steering wheel. Is your bluetooth and internet (3G | 4G) enabled? Are you next to the right IONIQ? Try to log out and log in again. If all else fails, reinstall the app and login again. Do you have the foot on the brake? Has the charger been removed from the car and stored in the trunk? Do you have the foot on the brake? It may be that the car has not yet started, so it's only on contact. Hold the foot on the brake and press the start button. Where do I find the handbrake? The IONIQ's hand brake is electronic. This button is in the center console. Are bluetooth and internet (3G | 4G) enabled? Are all doors closed? Is the car from contact? Where are the car papers? This is right, the mirrors can be manually folded in and out. The speed limiter is activated. On the right side of the steering wheel you can use the "mode" button to activate and deactivate the cruise control and the speed limiter. Please press the unlock doors button in the app. When you open the car and do no start it within a minute this happens. So please press the open doors button again. I cannot end my reservation? Make sure you are in the drop zone. Close the doors first. Try to log out and log in again. If all else fails, reinstall the app and login again. Contact support at 085 0475 055. With the charging drop of Travel Card you can use all the public charging points in the Netherlands and Belgium. It is also possible to load at a limited number of charging stations in Germany and Luxemburg. You can find them on the website oplaadpalen.nl. Via this website you will find an up to date overview of the charging stations. You can select 'Travelcard' as 'betaalmethode' on this website. You will immediately see where you can charge your IONIQ. Can I charge outside of Amsterdam? Yes you can. At every public charging point. Where can not be parked? Parking is not allowed in non free accessable parking spaces such as private grounds, loading and unloading facilities, parking spaces for disabled, car dates, other car sharing providers like Greenwheels or places with a time restriction. Do I have to pay on a paid parking? No, a parking permit has been issued for these cars, so you do not have to pay with the IONIQs on paid public (street) parking spaces in Amsterdam. You can park in Amsterdam on free and paid public (street) parking spaces. You can also park in front of a EV charging station only if you have connected the charging cable to the charging station. Click here for an overview of the parking areas. If you park in another place during use, for example in a parking garage, in a business area or in a blue zone then the parking costs are for your account or you should use a parking disc. Please do contact our customer service department. Hold the charging token again in front of the charging station. The light should change from blue to green. If this does not work or the charging token is not in the car, please contact our customer service. Press the "open doors' button in the app again, or press the open "lock" in the left front door. If this is not successful then the lock is not functioning properly. There is a storage bin in the trunk under the cover plate. Get this out of the car. At the bottom of the trunk is a steel drawstring. Gently pull it with some force. This will manually unlock the charging cable. How do I open the cover of the car charger? On the left side of the steering wheel, on the dashboard you find 3 buttons. With the most left button you open the cover. How do I charge the IONIQ? You charge the car by using the charging key ring (token) and scanning it at the charging station After that, connect the loading cable to the car and charging station. Before you start using the car, you can report damage in the app. If you have already crossed this app section and you notice damage to the car, please contact us using the number shown on the sticker in the car. I damaged the IONIQ, what now? Complete the European Accident Statement form and send it to IONIQ car sharing, Entrada 100, 1114 AA, Amsterdam-Duivendrecht. Also report the damage by phone number on the sticker in the car. I have a collision, what to do? Keep calm and call the police and / or ambulance in case of injured or serious injury.. If there are no injured and no serious damage, you can handle the collision yourself. Please make pictures of the accident yourself. Fill in the European Accident Statement form and send it to IONIQ car sharing, Entrada 100, 1114 AA, Amsterdam-Duivendrecht. Please contact us to report the damage +31 (0) 85 0475 055. I have a flat tire, what to do? Are you in an unsafe place? Then call 112. Then contact customer services at +31 (0) 85 0475 055. The car battery is down, what to do? Are you in an unsafe place? Then call 112. Then contact customer services at +31 (0) 85 0475 055. IONIQ Car Sharing also has a mobile charging car which can recharge empty batteries. Car does nothing at all. Doors will not open with the app. Are bluetooth and internet (3G | 4G) enabled on your smartphone? Are you standing next to the car? If this does not help, cancel the reservation and see if there is another IONIQ nearby. Windscreen damaged, what to do?